When recalling the military service of citizens of Porter County, rarely do we consider those that served in the American Revolutionary War. Given that Indiana's statehood did not take place until 1816, 33 years after the conclusion of the war, and Porter County itself failed to exist as a political entity until 1836, it is understandable why the Revolutionary War would be a rather inconsequential military conflict within the annals of the county's history. The American Revolutionary War began as a war between the Kingdom of Great Britain and thirteen united former British colonies on the North American continent. The conflict would expand into a global war between several European powers. The war was the culmination of the political American Revolution, whereby the colonists rejected the right of the Parliament of Great Britain to govern them without representation, claiming that this violated the "Rights of Englishmen." In 1775, revolutionaries gained control of each of the thirteen colonial governments, formed the Second Continental Congress, and created a Continental Army. Petitions to King George III to intervene with the parliament on their behalf resulted in the members of the newly established congress being declared traitors and the states in rebellion the following year. Colonists responded by formally declaring their independence as a new nation, the United States of America, claiming sovereignty and rejecting any allegiance to the British monarchy. In 1777, the Continentals captured a British army, leading France to formally enter the war on the side of America in early 1778. France had been providing the Continental Army supplies, ammunition, and guns since 1776, thereby leveling the military strength of Britain. Spain and the Dutch Republic, both French allies, also went to war with Britain over the next two years. Throughout the war, the British were able to use their naval superiority to capture and occupy coastal cities. Control of the countryside, where 90 percent of the population lived, largely eluded them because of the relatively small size of their land army. French involvement proved decisive, with a French naval victory at Yorktown in 1781 leading to the surrender of the British army. In 1783, the Treaty of Paris ended the war and recognized the sovereignty of the United States over the territory bounded by what is now Canada to the north, Florida to the south, and the Mississippi River to the west. Two individuals who served in the American Revolutionary War are buried in Porter County; namely, Henry Batton and Joseph Jones. A third individual, James Morgan, has also been mentioned as buried in the county. Research concerning Morgan, however, will show that this claim is untrue as a result of fact-based coincidences. Henry Batton was born in Chester County, Pennsylvania, in 1750. Like the majority of Revolutionary War veterans, Henry's military service record must be pieced together using United States Bureau of Pensions records and muster records maintained by the National Archives and Records Administration. It is known that Henry entered military service on August 15, 1776, in Fayette County, Pennsylvania, as a member of Captain William Harrod's Company in Colonel Thomas Gaddis' Regiment. Batton's volunteer service in the army would exceed two years. Below is what is known of Batton's Revolutionary War service record. 1776, August 15 – Mustered into volunteer service in Captain William Harrod’s Company at Fayette County, Pennsylvania. Troops were marched from near Uniontown, Fayette County, Pennsylvania, to Atkinson’s Fort at the head of Ten Mile Creek in Monongalia County, Virginia (now Washington County, Pennsylvania) to serve as part of Colonel Thomas Gaddis’ regiment. 1777, February – Discharged from service at Atkinson’s Fort. 1777, April – Called into volunteer service and mustered into Captain William Cross’ Company. Troops were sent to Fort Pitt in Allegheny County, Pennsylvania, and Batton served as a sergeant under the command of General Edward Hand. Stationed at Fort Pitt for four months. 1777, August – Discharged from service at Fort Pitt. Called into volunteer service and mustered into Captain Theophilus Phillips' Company. Troops marched from near Uniontown, Fayette County, Pennsylvania, to Bell’s Fort along Ruff's Creek in Washington County, Pennsylvania, which was under the command of Colonel John Minor. Stationed at Bell’s Fort for two months. Dismissed from service but was “required to be in readiness to march into service when called.” Dismissal period lasted approximately one month before called back to duty. Called back into volunteer service in Captain Phillip’s Company and troops marched to Garrett’s Fort located in Greene County, Pennsylvania. Serviced at Garrett’s Fort for two months and then dismissed from service. Called back into volunteer service in Captain Phillip’s Company and reported for service at Fort Minor located in Greene County, Pennsylvania. Served at Fort Minor for two months and then dismissed from service. Called back into volunteer service in Captain Phillip’s Company. Troops marched to Stradless Fort in Virginia. Served at Stradless Fort for two months and then dismissed from service. Called back into volunteer service under Lieutenant Samuel McKinley. Troops marched to Martin’s Fort, which was situated on Crooked Run along the west side of the Monongahela River. Served at Martin’s Fort for two months and then dismissed from service. Called back into volunteer service in Captain Phillip’s Company. Troops marched to Henry Enoch's Fort on at the forks of the Cacapon River and North River [located today in Hampshire County, West Virginia]. Served at Henry Enoch’s Fort for two months and then discharged from service. Called into volunteer service to report to Fort Van Meter on the head of Muddy Creek in Pennsylvania (today located in Ohio County, West Virginia) under Captain Philips and Lieutenant Colonel John Minor. Served at Fort Van Meter for two months. 1778, September - Discharged from service. Note that is is quite possible that prior to the Revolutionary War that Henry also served in Lord Dunmore's War in 1774, which was a conflict between the Colony of Virginia and the Mingo and Shawnee Indian nations. Tracing Batton's whereabouts after the Revolutionary War is difficult. An application submitted in 1914 by John Onesimus Foster, a eighty year old clergyman from Seattle, King County, Washington, for membership in the National Society of the Sons of the American Revolution indicates that Henry Batton was John's great-grandfather. The application stipulates that the name of Henry's wife was Elizabeth; this information reportedly being taken from a deed. Interestingly, another application for membership in the National Society of the Sons of the American Revolution was submitted in 1923 by Stephen Joseph Herben, the grandson of John Onesimus Foster. In his application, Stephen writes that "Rev. John O. Foster remembered 'Uncle Henry' well." Given that John was born in LaPorte County, Indiana, in 1833, he indeed very likely interacted his great-grandfather, who died when John was 12 years old. Though being John's great-grandfather, Henry Batton was probably called "Uncle Henry" by the entire community. It is known that Henry had at least one child, Hannah Batton, born June 10, 1779, in Marion County, Virginia (now West Virginia). Some sources suggest that Hannah was Henry's sole offspring. Henry's wife, Elizabeth, would pass away in Virginia. Hannah would marry John Hageman on March 22, 1798. John Hageman was born in Bucks County, Pennsylvania, on October 9, 1768. He would die in 1843 and Hannah in 1845, both in Porter County; they are both interred in their family plot at Gossett Cemetery in Porter County's Liberty Township. Henry Batton most likely followed his son-in-law and daughter to Indiana. John Hageman and his family initially moved to Union County, Indiana, residing there for a short period of time. They then migrated to Montgomery County and thence to Fountain County, residing in or near the town of Rob Roy. A son, Henry Hageman, would move to LaPorte County, Indiana, in 1832, residing with his brother-in-law, John I. Foster. Along with Jacob Beck and William Gossett, Hageman and Foster would later move to Porter County, establishing the small community of Waverly north of Chesterton. John Hageman, his wife Hannah, and Henry Batton would later move to Porter County. Before me John Bodley a justice of the peace in and fore said county personally came. Henry Batton who being duly sworn as the law directs [---?---] and saith that he was called into service of the Revolutionary War by authority of the State of Pennsylvania as a volunteer in the Month of August or September in the year 1776 under captain William Heoared was marched from near Uniontown in Pennsylvania to Atkinson's fort on the head of ten mile [creek] in the date aforesaid continued in the service [---?---] until the month of February 1777 when he was discharged. That during this service he was bound to the regiment of Col Gaddis as stated in the foregoing declaration. That in the month of April in the last named year he was called a second time into the service under Captain William Cross as a volunteer by a call from the Governor of Penna and went to Fort Pit[t] in Penna and continued stationed there for four month when he was again discharged. That General [Edward] Hand commanded at fort Pit[t] at that time . That both during the above [---?---] he was a [---?---] sargent. That he was called again into service by the same authority in the company commanded by Captain Theophilus Philips was marched from near Uniontown Penna to Bells fort in the same state was attached to Col Minor's regiment and continued in service two months when we were dismissed when we were required to be in readiness to march into service when called on and was called on again about one month after we were dismissed under the same officer and went to Garrets fort in the State of Penna when we were again dismissed after having continued in service two months. And he was called again unto service under the same officers to go to fort Miners on by [---?---] in Penna where we continued two months when we were again dismissed. Was called again into service under same officers and was marched to Stradless fort in the State of Virginia where we continued two months and was again dismissed. Called again into service under Lt. McKinley and was marched to Martins fort in the line between Pennsylvania and Virginia and continued there two months was called again into service under Captain Philips and marched to Enoch fort on 10 Mile Creek in Pennsylvania where we continued two months when we were discharged. On every tour he was an orderly sergeant. That he was called out to go to Vanmeters fort on the heads of Muddy Creek Pa under Captain Philips and Lt Col Miner. Continued in service two months. The he believes the he served in all twenty five months that he cannot state the periods of time at which all those short tours happened but is well satisfied he has served in all two years or upwards. Question 1 Where and what year was you Born. I was born in the year 1750 in Chester County Pennsylvania. Answer to second question I have a written record of my age copied from my father's Bible into my own. Answer to the Third question I lived in Fayette County Penna when called into service . since the Revolution I have lived in Pennsylvania in Virginia and Indiana & now live in Fountain County Inda. I was called in service each tour above stated as a volunteer and was acquainted with the above officers above stated have no discharge. Sworn to & subscribed this 27th day of January A. D. 1833 before me. On this 11th day of March 1833 personally appeared in open Court of Fountain County, now sitting, the same being a court of record, Henry Batton a resident of Fountain County in the State of Indiana, aged eighty three years, who being first duly sworn according to law, doth on his oath make the following declaration, in order to obtain the benefit of the Act of Congress, passed June 7th 1832. That he entered the service of the United States and was immediately appointed Sergeant in Capt. Harrods company under the following named officers and served as herein stated. Col Thomas Gaddis, Lt Col John Minor, Capt Wm Harrod and Capt Wm [---?---] and Lt Saml McKinley. Entered the service 15th August 1776, left the service September 1778. At the time of entering the service he resided near Uniontown, Fayette County, Pennsylvania, and entered the service as a volunteer, marched while in the service through the counties of Pennsylvania and Virginia. Served in a Battalion of volunteers from the State of Pennsylvania, and while in the service became acquainted with the following named company officers, Capt James Neil, Capt John Sparks and Lt John Hardin belonging to the regular service. That applicant is destitute of any documenting evidence to substantiate his claim, and has not the power of procuring the testimony of persons to his services. He hereby relinquishes any claim whatever to a pension or annuity except the present, and declares that his name is not on the pension roll of the Agency of any state. Sworn and subscribed, the day and year aforesaid. That Solomon McKinney a clergyman residing in the county of Fountain Indiana and Frederick C. Paine residing in same county & state hereby certify, that we are well acquainted with Henry Batton who has subscribed and sworn to the above declaration, that we believe him to be eighty three years of age, that he is reported and believed in the enighborhood where he resides, to have been a soldier of the revolution, and the we concur in that opinion. Sworn and subscribed the day and year aforesaid. And the said Court do hereby declare their opinion, after the investigation of the matter, and after putting the interrogatorial prescribed by the War Department, that the above named applicant was a Revolutionary Soldier, and served as he states. 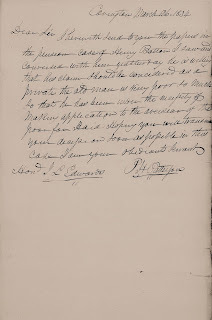 And the Court further certifies that it appears to them that Solomon McKinney who has signed the preceding certificate is a clergyman resident in Fountain County Indiana and that Frederick C. Paine who has also signed the same, is a resident in the same county & state and is a creditable person, and their statement is entitled to credit. service during the Revolutionary War, dated July 27, 1833. I herewith send to you the papers in the pension case of Henry Batton. I saw and conversed with him yesterday. He is willing that his claim should be considered as a private. The old man is very poor so much so that he has been under the necessity of making application to the overseer of the poor for aid. Hoping you will transmit your decision soon as possible in this case. Upon receipt of Henry's application for a pension, the Bureau of Pensions replied that he would not be able to claim a pension for serving as a sergeant unless he could provide additional proof of being enlisted at that rank. Instead, his pension would be at the lower rate for those veterans that served as privates. As the letter above shows, he accepted a private's pension rate. Hence, Batton's pension was approved and by 1839 he was receiving an annual pension totaling $73.33. Evidence suggests that Batton removed to Porter County, presumably from Fountain County, Indiana, either in 1839 or 1840. On July 3, 1840, Batton united with the Presbyterian Church of Valparaiso via a letter from a congregation in Virginia. He was also instrumental in the construction of the Presbyterian Church in that community, which was completed in 1844. Three factors likely motivated his move north. First, he was ninety years old and likely needed some assistance in performing everyday household tasks. Second, his son-in-law and daughter were residing in the Porter County by 1840 and could provide the needed assistance. Third, even with his military pension, he would have probably had difficultly living on $73 per year and required some measure of financial assistance from his daughter's family. veterans that served as private, dated March 26, 1834. There were many groups from distant points attending the funeral of Henry A. Battan [sic]. Sleighs, cutters and bob-sleds filled the side streets, and every hitching rack around the square was occupied. Father Battan would have been pleased to see that all the horses were well blanketed. There were visitors from Crown Point, The Corners, Hickory Point, Jackson Township, Coffee Creek and City West, and all nearby communities. The church was filled. Burial was in the Gosset [sic] cemetery. His remains were interred on the crest of a hill overlooking Salt Creek in the Gossett Cemetery in Liberty Township. The name Batton was engraved on the Gossett burial monument and Henry's burial tombstone was marked with a simple "H. B." Though it was commonly recognized that Henry Batton was buried in Porter County, little was known about his military service. Mark L. Dickover, an active historian of the county, wrote a letter to the United States Bureau of Pensions on May 10, 1910, to ascertain any information that could be provided concerning Batton's activities during the Revolutionary War. Henry Batton, dated May 10, 1910. The material gathered by Dickover was presumably maintained in county historical files. During the late 1920s and early 1930s, state and local chapters of the National Society of the Daughters of the American Revolution (D.A.R.) began erecting thousands of memorials at the gravesites of Revolutionary War soldiers. The William Henry Harrison chapter of the D.A.R. located in Valparaiso was no exception. On Sunday, June 23, 1929, this chapter held a ceremony at 2:30 pm at the Gossett Cemetery to erect a bronze plaque to commemorate the military service of Henry Batton. The ceremony included a benediction, speeches, a laying of a wreath, the singing of the America, a firing of volley shots as a salute, and concluded with the playing of taps. An identical ceremony was held that day at 4:30 pm at Boone Township's Cornell Cemetery to mark the burial location of Joseph Jones. In a letter sent to the United States Bureau of Pensions on November 10, 1930, by members of Fountain County's Richard Henry Lee Chapter of the D.A.R., a request was made to identify Henry Batton's "exact burial place." The members wrote that they were "extremely anxious to do this properly and are asking you [the Bureau] to help us." It appears that the Fountain County D.A.R. chapter believed that Henry Batton was interred in their county due to his military pension application originating from there. The anxiety mentioned in the letter was probably due to the fact that the Fountain County D.A.R. chapter had already obtained a military tombstone from the federal government for installation at Batton's burial site. But where was Henry buried? It was soon determined that Henry was buried in Porter County. Thus, in November 1930 the military tombstone was delivered from the Fountain County D.A.R. chapter to Gossett Cemetery for installation. If you visit the Gossett Cemetery, then you will not find the bronze plaque. The plaque was discovered to have been stolen in February 1966. In addition, vandals had dug two feet into the ground and physically removed the military tombstone that was ordered and installed by the Fountain County chapter of the D.A.R. in 1930. It is suspected that the vandals may have intended to steal the tombstone as well since it was placed against a fence on the opposite side of the cemetery from where Batton is buried. location where stolen bronze marker was located at Henry Batton gravesite. removed from gravesite to the cemetery's boundary fence. Source: The Vidette-Messenger, February 12, 1966. Note that there are some published facts concerning the life of Henry Batton that are most certainly untrue. A biographical sketch of of John Hageman published in 1894 states that his wife, Hannah (Batton) Hageman, "had three sisters, all of whom were born at one birth [i.e. quadruplets] and all of whom lived, married and reared twelve children each." This statement is clearly false given other documents state that Hannah was Henry Batton's only child. Of all the historic characters that ever lived in these woods, the above was one of the most noted. He lived to the most remarkable age of ninety-five, passing away Feb. 1, 1845. He was thought to be a native of West Virginia, and lived near Morgantown, on the banks of the Cheat river. His people were of Welsh descent, and shortly after they came to the United States moved west to Virginia. When the War of the Revolution in 1776 broke out, young Henry Batton was a full grown man, and promptly enlisted in the Colonial army. From scraps of evidence in the possession of relatives he must have been a non-commissioned officer at least, and some think he held a rank of captain. He had all the military habiliments of a colonial soldier, short pants, long stockings, knee and shoe buckles made of pure silver. These buckles were eventually melted up and made into spoons, and in after years my mother was the happy possessor of one of these priceless relics. They were handed down to the children and grandchildren for six generations. One or two are yet in existence. Batton had a wonderful progeny. It is claimed that no parallel record is extant, showing just such a case of human increase. He obeyed the injunction of the Good Book, where the command was given our first parents to multiply and replenish the earth. Mrs. Batton presented her husband with three bouncing girl babies at one birth. The triplets were strong and healthy, and eventually grew to womanhood. Jemima Batton married a Mr. Merrill. Elizabeth Batton married another Mr. Merrill and Eleanor Batton married a Snodgrass. A fourth daughter, Hannah Batton (the eldest of the four) married John Hageman, the progenitor of the Hagemans of Porter county. Each one of the triplets, namely, Jemima, Elizabeth and Eleanor, had twelve children, all of whom were living when Henry Batton, with his son-in-law John Hageman, who married Hannah Batton, as stated, the oldest of the four girls, came west and finally settled in Waverly. Of the many stories which the old soldier told his children, grandchildren and great grandchildren all have been forgotten save a few precious ones which still echo as valuable memories. When Batton and John Hageman came west, in the company was a colored man by the name of John Gavin, who had been a slave, but by some means was now a free man. He lived here near Porter for many years as an honest, upright, industrious citizen. George W. Beck still shows a beautiful Indian brooch given him by the said colored individual. When John I. Foster moved from LaPorte to this neighborhood and was engaged in platting Waverly Village, and while at work on the survey, a young man came along by the name of Joseph Morgan, and was employed to carry chain and call "stick, stuck," as the lines were run, and then to drive stakes at the corners of the lots in the embryo village. "Uncle Joe" Morgan has given us many valuable facts about the men and scenes of those early days, and for which, with a score of others, we are greatly indebted. Henry Batton was entitled to a government pension and was anxious to secure the same. To this end he secured the services of Jesse Morgan (father of Joseph) and for whom the city of Morgantown, West Virginia, was named, to make out the necessary papers in order to secure the pension. In due time the old soldier was entered as a pensioner and allowed to draw twelve dollars a month for many years. This was considered a very liberal allowance for the men of those days and one of the facts to show that he was an officer. When nearly ninety years of age he walked from his home here to Valparaiso four times a year to get the money and seemed to enjoy the regular outing. He, too, was a famous marksman and many a deer fell before his unerring rifle. One time when returning from a long hunt, and it grew quite dark, there was in the path before him something that appeared unfriendly, whether panther, lynx or wolf, he could not determine, but the beast evidently meant fight, and the hunter was not in a mood to accommodate him without a shot to open the battle. He leveled his rifle, moved it up slowly till the form darkened his sight pulled the trigger and blazed away at the beast. When the smoke cleared away, he approached carefully the prostrate form and found he had shot an immense wolf, the ball having traversed nearly the entire length of its body. This wolf story is still well remembered. Away back in the days of the Colonial Wars, the Indians were exceedingly annoying. Beaten in battle, they never seemed to know when they were whipped, and a route, was only to given them vantage ground for a new stand. Then when the troops were in camp their incessant firing from behind rocks and trees, from the far off hill sides and sheltered nooks, made the troops much trouble and resulted in constant loss. The soldiers took up the affair in threatened retaliation, fully as grewsome as the burning at the stake, running the gauntlet or shooting fiery arrows into captives bound to a tree. It was hideous, cruel war, in all its wild barbarity. The soldiers shouted from their camp to the Indians on the hill sides, "Stop your firing or we will treat the next captives to the knife, and scalp and skin them." The time soon came when a small squad of Indians was captured and the soldiers, without orders, and contrary to the wishes of the officers, actually skinned some of the captives. It was a premeditated, deliberate job. The skins of the Indians were tanned and hung up where they could be seen by the belligerents, and they duly informed that the threat had been fully carried out. Batton did not sanction the act, in fact, he was much grieved at the same when it came to his notice. The soldiers cut up the skins and made them into saddles covers and razor strops. one of these "red skin razor strops" was brought to Indiana, and was seen by our relatives. But the awful fact of the skin of a human being hanging in full sight of the enemy for several days had the desired effect and the galling fire from the hills ceased. The Revolutionary and Indian Wars were practically at an end. Our nation has dealt generously by the Indians in the main, but in some cases the crime of fraud will rest upon the official acts as long as true accounts are written. 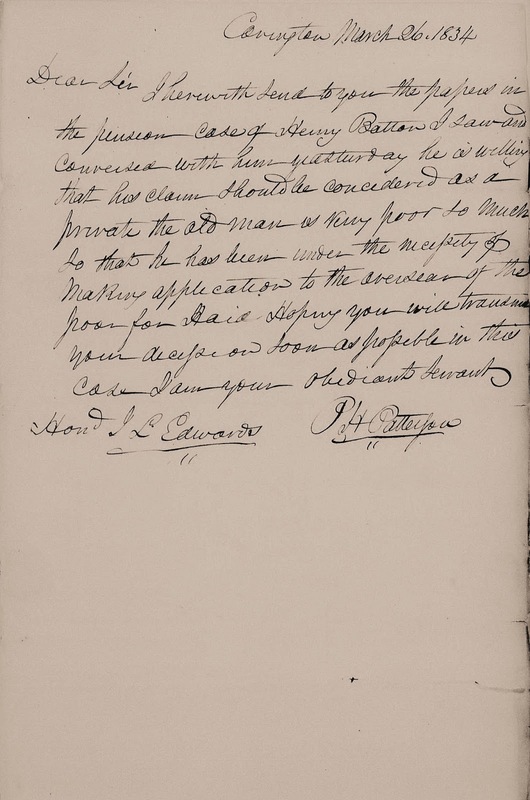 The historian says "the Indians caviled at the old treaty, and refused to comply;" that is, the Sac, Fox and Winnebago Indians were ordered to send deputies of official standing to St. Louis about 1832, to conclude a treaty. The chiefs refused to attend, but a lot of scalawag Indians did attend, were loaded with presents, feasted and feted and their signatures placed on the treaty. The Blackhawk War followed and the tribes dispossessed of some of the choicest lands in America, without receiving due compensation. Such are some of the facts charged against the United States. Batton's patriotism flamed up again to white heat in 1812, in what was known as the "Late War" with England. His regiment was eventually ordered south and joined General Jackson's forces then preparing to defend the city of New Orleans against the attack of the British under Gen. Packenham. "Earthworks were constructed, and a long line of cotton bales and sand bags thrown up for protection. On the morning of the memorable 8th of January 1815, the British moved forward. They went to a terrible fate. The battle began with the light of the morning and was ended before nine o'clock. Peckenham hurled column after column against the American position, and column after column was smitten with irretrievable ruin. Jackson's men, behind their breastworks, were almost entirely secure from the enemy's fire, while every discharge of the Tennessee and Kentucky rifles told with awful effect on the exposed veterans of England. Packenham, trying to rally his men, was killed. Gen. Lambert, alone, was left in command to call the shattered fragments of the army from the field. Never was there in a great battle such disparity of losses. Of the British fully seven hundred were killed, fourteen hundred wounded and five hundred taken prisoner. The Americans loss amounted to eight killed and thirteen wounded." -- Ridpath. Memories of the Battle of New Orleans lingered long in the unwritten histories of the nation. Stories were told over and over again by the old soldiers who were participants in that sanguinary engagement and coming from both friend and foe, were exceedingly interesting. Two of which will do to repeat. this one from a British soldier seems to record as heroic an act as any which Jasper, or Pickett exhibited in later years. "As we approached the long line of the American ramparts, we were ordered to reserve our fire till near the earth works, and the cotton bales, then to fire at command, rush through the smoke and assault the works. When fully a half mile away, we saw a tall, slim man stand up, fully exposed to view, pull down his old slouch hat, level his rifle off hand and fire. An officer at my right dropped from his horse mortally wounded. The man loaded his piece, deliberately ramming down the ball of his long gun with steady composure, primed his piece from his powder horn, pulled down his hat again, took steady aim, fired, and General Keene fell. Again he loaded, and by this time we were quite near and ready for our orders to fire, but before we raised a gun he fired a third shot and picked off another officer, General Gibbs, I believe. Then there was a roar of war too deafening to describe, the volleys were from both sides, our men fell in heaps, the dead and dying were all around me, and yet I was spared. Next day General Jackson granted a truce for the gathering and burial of the dead. Gen. Packenham's body was taken to a ship and placed in a hogshead of rum, and deposited in the hold of the vessel, which carried us back to England. On the way home the soldiers tapped the cask and drank off al the rum." When age came on and the steps of the old warrior began to fail, he authorized my father John I. Foster, to go to the village of Valparaiso and draw his pension money for him while he "tinkered" around the house. Henry Batton was always busy, and one day attacked the steep bank where the slippery pathway led down to the crossing of Coffee creek. While digging away at the tough clay, and having the roadway almost completed, a fine looking lady came along and complimented him on the good he was doing. She expressed her appreciation of his efforts to make the road so much better, by handing him a bright silver quarter of a dollar, which the old gentleman took and kept for a long time as the only compensation he had received for working on the roads since he quit service in the United States army a generation before. It is doubtful whether Porter county ever had a man work on the roads, at ninety years of age, at 25 cents for the job. He was fond of the woods, and would go out under the great trees in summer time and sit for hours looking up at the great monarchs of the forest, and when the time came to clear up the broad acres now smiling in the in the sunlight of Waverly, he became a tireless chopper and helped to open up the fields, now so beautiful and which are without a stump or root, to impede the plow. It was a curious sight to see the old man, nearly blind, chopping away at a big tree, cutting around and around the trunk like a beaver in his efforts to destroy the tree. His vision was too imperfect to see how the tree leaned or which way it would fall, but when he thought it was about time to come down he would call George Washington Beck to come and tell him which way the tree was leaning so that he could run away while it was falling. His partial loss of sight caused him great trouble and suffering. One day, returning from Valparaiso and entering the yard, his toe caught under the end of the board walk, he fell heavily and broke, or dislodged his hip. From that time on for nearly a year he never walked a step without crutches or help. Can any other man found in these parts who has walked from Valparaiso to Porter after he was ninety-three years of age? the news of the death of the old soldier spread far and wide, and in due time reached us in Iowa Territory, and all said that a great and good man is at rest. His descendants probably have numbered more than a thousand souls. In 1883 the Converse & Reeves stage was put in operation making the round trip [from Fort Dearborn to Detroit] in three or four days, and, to see 'what was on the other side of the mountain.' Henry Battan [sic] made this round trip. By 1883, Batton had been dead for more than 37 years. And Henry's surname is misspelled throughout Wallace's column. All military service records and pension documents, including those submitted by Henry, consistently spell his surname as Batton. There were other individuals named Batton born about the same time as Henry in Chester County, Pennsylvania; how these individuals are related, if at all, is unknown. Wallace was known to embellish his stories, making up facts in order to produce interesting regional history columns for the readership of The Vidette-Messenger. Therefore, columns written by the The Stroller should be questioned with regard to their historical accuracy. Joseph Jones is the other known Revolutionary War veteran to reside in Porter County, Indiana. Jones was born in 1755 in Worcester, Worcester County, Massachusetts, the son of Joseph Jones and Nellie (Barbary) Jones. It is known that prior to reaching Porter County in 1841 to live in Boone Grove that Jones was residing in Holmes County, Ohio. He died soon after arriving in Boone Grove, passing away on October 28, 1841. It is suspected Jones may have moved to Porter County to be near one of his children due to either illness, infirmity, or old age. Alternatively, he may have migrated to Porter County after obtaining a land grant in compensation for his military service. In 1775, Joseph Jones married Ruth Holden, a woman about seven years his elder. Ruth was born on May 2, 1748, at Harvard, Worcester County, Massachusetts, the daughter of Justinian Holden and Ruth (Robins) Sawyer Holden. Their union resulted in at least two children; a daughter Lydia was born on June 28 1775, at Mendon, Norfolk County, Massachusetts, and a son Moses was born on August 27, 1776, at Harvard. Ruth would pass way in August 1820 at Richland County, Ohio, at the age of 72 years. from Joseph Jones' muster roll records. Joseph Jones' military service records indicate that he served as a private in Colonel Timothy Bigelow's regiment, enlisting on January 1, 1776, and mustering out of service on January 9, 1777. He enlisted into military service again on November 10, 1777, for a three year term, serving as a private in Captain Sylvanus Smith's Company in the Battalion of Massachusetts State Forces commanded by Colonel Bigelow. He would encamp with General George Washington's troops at Valley Forge, Pennsylvania, during the winter of 1777-1778. Joseph was discharged from service on November 10, 1780, at which time he was still serving as a private in Captain Sylvanus Smith's Company of the 15th Massachusetts Regiment commanded by Colonel Bigelow. Thus, Joseph Jones served nearly five years in military service during the war. Jones' Will, dated March 11, 1840, appears in Porter County Will Book A (pp. 12-13); it was proven in open court on February 13, 1843. Where Joseph's body is buried is somewhat of a mystery. Records suggest that he was interred in Cornell Cemetery in Porter County's Boone Township. However, a National Archives and Records Administration military graves registration card indicates that he was buried at a Presbyterian Cemetery in Perrysville, Ashland County, Ohio. Indeed, there is a military tombstone at Perrysville Union Cemetery inscribed with the name Joseph Jones with birth and death dates identical to the Joseph Jones that died in Porter County. It seems rather unlikely, however, that if Jones died in Porter County that his remains would have been transported to Ashland County, Ohio, for burial. There were no rail lines in either Porter County or LaPorte County until 1852. Transporting his body by ship via Michigan City to Sandusky or Cleveland, Ohio, and then south to Perrysville would have been an arduous, and probably expensive, task. 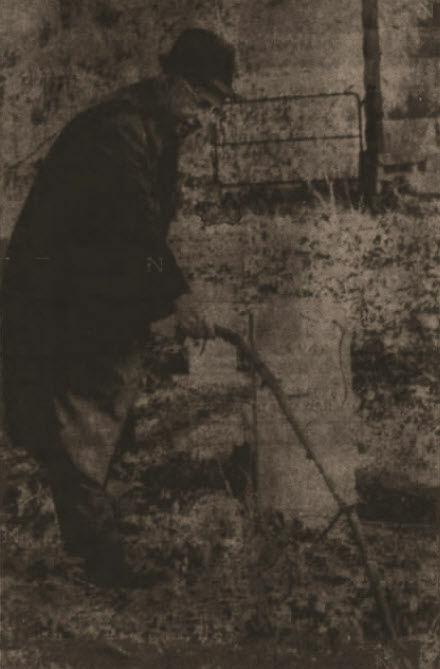 The Lewis Publishing Company's history of Porter County, published in 1912, mentions that "his [Joseph Jones'] remains rest in an unmarked grave in the old Cornell Cemetery." Today, there is a headstone marking Joseph's burial site at the Cornell Cemetery. Who knows the burial place of James Morgan, a revolutionary soldier, who died here March 1, 1840? The Daughters of the American Revolution want to know, that they may give his grave the honor due. Until a letter was received here this morning, it was believed that only two soldiers of the revolution had been laid to rest here -- Henry Battan [sic, Batton] and Joseph Jones. Mrs. H. W. Stone, of Caldwell, Ida., in communication to the county clerk's office, sought the first name of her great-great-grandmother, and the dates of her birth and death. In the same letter she gave the information about her great-great-grandfather, which is received here with much animation. "My great-great-grandfather, Jas. Morgan," Mrs. Stone writes, "died March 1, 1840, in or near Valparaiso. He was a revolutionary soldier and a brother of General Daniel Morgan, 1737 [should be 1736]-1802. His wife died there also. Her last name was Cox. Can you give me her first name; also the date of birth and death?" The letter was a revelation to those here interested in the history of the county. Everything possible will be done by the D. A. R. and Indiana centennial organization to bring to light the patriot's resting place. Further information is being sought at Washington on the record of Henry Battan who was buried in the Gossett cemetery, that an appropriate monument may be erected there for him. 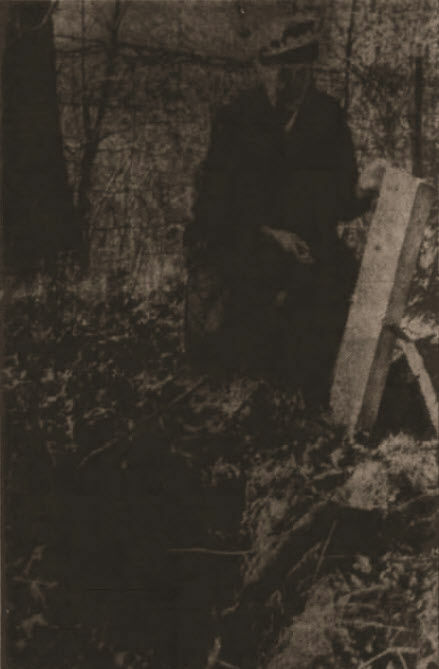 Indeed, research was conducted to determine the burial location of James Morgan based on the information provided by Louise (Finney) Stone in 1916 to the Porter County Clerk. The research, however, bore no fruit and uncertainty remained as to whether Porter County was the final resting place of a third Revolutionary War soldier. In 1828 Jesse, Isaac, and William Morgan, three brothers, left their native home in Monongehala [sic] county, Virginia, for Wayne county, Ohio, from where they moved into Laporte county, Indiana, where they were appointed to fill responsible positions in that county that had sprung into existence but a short time previous. But they were not yet satisfied with their location, and, in 1833, with their large families and worldly effects, they come by the way of the Old Soc [sic, Sauk] trail into this county in 1833. Isaac and William Morgan settled on the beautiful prairie that now bears their name. Jesse Morgan settled in what is now West Chester township, on section 6, on the Detroit and Chicago road heretofore spoken of. The parents of these three Morgan brothers were James Morgan and Hannah (Cox) Morgan. Interestingly, James was a Revolutionary War soldier, as well as a soldier in Lord Dunmore's War against the Mingo and Shawnee Indian nations. James was born on January 10, 1755, in Frederick County, Virginia, and died on April 11, 1823, in Franklin, Wayne County, Ohio; he is interred at Butler Cemetery situated in Moreland, Wayne County, Ohio. James and Hannah had another son that did not migrate to Indiana, his name was James Morgan. James, son of James and Hannah, was born in 1794 and at some point in time migrated to Iowa. He died in 1840 and was buried at Spring Grove Cemetery in Des Moines County, Iowa. It was these two James, directly related to Porter County's pioneer Morgan brothers (Isaac, Jesse, and William), that most likely led Louise (Finney) Stone to believe that her James Morgan ancestor died and was buried in Porter County. James the elder was a veteran of the Revolutionary War, while James the younger died in 1840; those two facts match the information in Stone's letter. Louise (Finney) Stone's ancestor, however, was another James Morgan that served in the Revolutionary War and coincidentally died in 1840. Her James was born on April 5, 1748, at Berkeley County, Virginia (now West Virginia) and was the son of David Morgan and Sarah (Stevens) Morgan. He would marry Margaret Jolliffe in 1786 in Uniontown, Fayette County, Virginia, and not Hannah Cox as suggested in Stone's letter. The union between James and Margaret yielded at least twelve children - five sons and seven daughters. James' date of death was March 1, 1840, which matches the date of death mentioned in Stone's letter to the Porter County Clerk; he died in Wauwatosa, Milwaukee County, Wisconsin, and was buried in Wauwatosa Cemetery. A handsome plaque was erected in this cemetery in 2005 commemorating James Morgan's Revolutionary War service. Records indicate that at least one widow of a Revolutionary War soldier is buried in Porter County. Susannah (Choate) Fifield, wife of veteran Benjamin Fifield (b. 1754, d. 1825), migrated from Enfield, Grafton County, New Hampshire, and located in Porter County early in the county's history. She may have been following her son, Thomas Hale Fifield and his wife, Alice (Carter) Fifield, to Porter County. 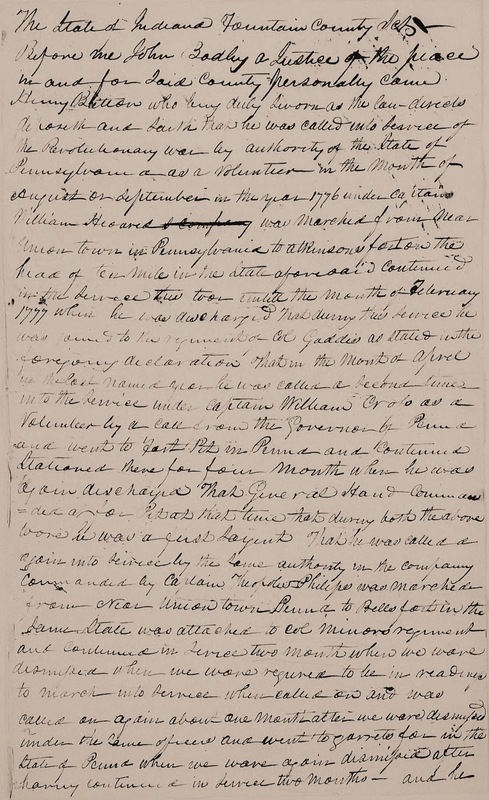 Records of the Valparaiso Presbyterian Church reveal that Susannah Fifield was received into that congregation by letter on August 22, 1852. Susannah would draw a military pension from the federal government as a result of Benjamin Fifield's military service, out of which she gave annually ten dollars to foreign missions. She would pass away in 1856.The location of Susannah's remains is unknown, but evidence suggests that she may rest in an unmarked grave in Valparaiso's Union Street Cemetery. Benjamin Fifield served as a private in Captain James Osgood's Company of the New Hampshire Rangers, which was attached to Colonel Timothy Bedel's Regiment of the First New Hampshire Northern Army. Fifield's regiment fought in the frontier region of New Hampshire, as well as in Canada. Given the evidence, it appears that only two veterans of the Revolutionary War, Henry Batton and Joseph Jones, are interred in Porter County. The fact that a second tombstone exists for Joseph Jones at Perrysville Union Cemetery in Ashland County, Ohio, however, does create some measure of uncertainty as to whether he is truly buried at Cornell Cemetery near Boone Grove. Beckwith, H. W. 1881. History of Fountain County, Together with Historic Notes on the Wabash Valley. Chicago, Illinois: H. H. Hill and N. Iddings. 494 p.
Linn, John Blair, and William H Egle. 1880. Pennsylvania in the War of the Revolution, Battalions and Line. 1775-1783. Volume I. Harrisburg, Pennsylvania: Lane S. Hart. 794 p.
Anonymous. 1906. Graves of Revolutionary Soldiers. The Indiana Quarterly Magazine of History 2(2):97-99. National Archives and Records Administration. 1912. Case Files of Pension and Bounty-land Warrant Applications Based on Revolutionary War Service. Compiled circa 1800 to circa 1912. Publication No. M804, Record Group 15, Roll 0178, Pension No. S 31542 (Henry Batton). Washington, D.C.: National Archives and Records Administration. 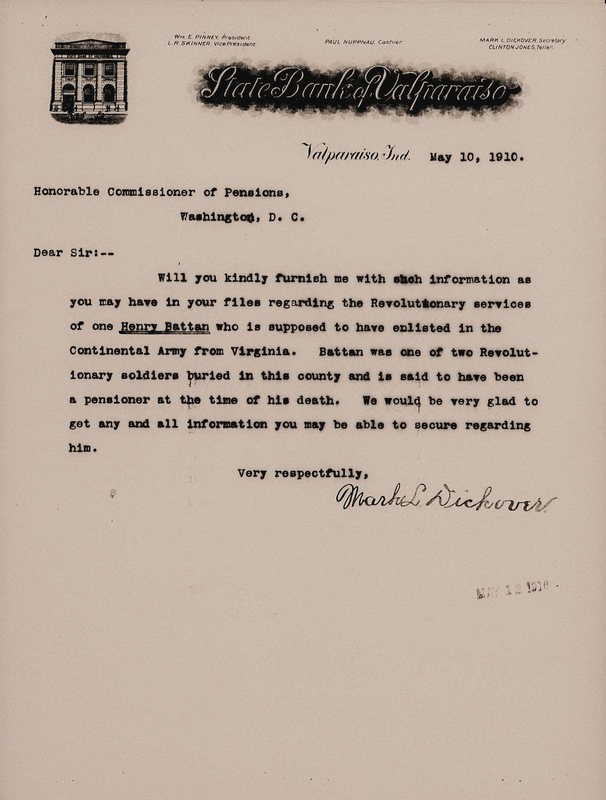 39 p.
National Archives and Records Administration. 1912. Compiled Service Records of Soldiers Who Served in the American Army During the Revolutionary War. Compiled circa 1894 to circa 1912. Publication No. M881, Record Group 93, Roll 0454. Washington, D.C.: National Archives and Records Administration. The Chesterton Tribune, Chesterton, Porter County, Indiana; October 18, 1901; Volume 18, Number 28, Page 8, Columns 4-6. Column titled "Looking Backward, An Old Timber's Narrative or Porter County, Indiana," by John O. Foster. The Porter County Vidette, Valparaiso, Porter County, Indiana; April 5, 1916; Page 4, Column 6. The Vidette-Messenger, Valparaiso, Porter County, Indiana; September 24, 1927; Volume 1, Page 1, Columns 4-5. Column titled "Valparaiso Man Recalls Meeting Revolutionary War Veteran; 2 Found Resting Places in County." The Lake County Times, Hammond, Lake County, Indiana; September 30, 1927; Volume 22, Number 73, Page 10, Columns 1-2. Column titled "Valpo Citizens Recall Veteran of Revolution. Saw Him on Platform at Cincinnati With Grandfather of Hammond Physician." The Vidette-Messenger, Valparaiso, Porter County, Indiana; May 7, 1929; Volume 2, Page 2, Column 7. Column titled "D. A. R. Plan Mark Graves." The Chesterton Tribune, Chesterton, Porter County, Indiana; June 20, 1929; Volume 46, Number 15, Page 1, Column 4. Column titled "Honor Revolutionary Soldiers on Sunday." The Vidette-Messenger, Valparaiso, Porter County, Indiana; June 21, 1929; Volume 2, Page 10, Column 4. Column titled "Patriotic Organizations Join in Paying Tribute to Porter County Soldiers of Revolution." The Vidette-Messenger, Valparaiso, Porter County, Indiana; June 22, 1929; Volume 2, Page 1, Columns 4-5. Column titled "Patriot's Day Pilgrimage to Honor War Heroes, Sunday." The Chesterton Tribune, Chesterton, Porter County, Indiana; June 27, 1929; Volume 46, Number 16, Page 1, Columns 2-3 and Page 6, Columns 4-6. Column titled "Is Porter Porter?" The Indianapolis Sunday Star, Indianapolis, Marion County, Indiana; May 11, 1930; Volume 27, Number 340, Part 5, Page 11, Column 1. Column titled "Activities of Indiana D.A.R.," by Estelle Marshall Walters. The Vidette-Messenger, Valparaiso, Porter County, Indiana; November 12, 1930; Volume 4, Page 1, Columns 2-3. Column titled "Find Grave of Revolutionary Soldier in Gossett Cemetery for Fountain County D. A. R."
The Lake County Times, Hammond, Lake County, Indiana; November 13, 1930; Volume 25, Number 105, Page 6, Columns 6-7. Column titled "Locate Grave of Revolution Vet in Porter." The Vidette-Messenger, Valparaiso, Porter County, Indiana; August 6, 1935; Volume 6, Page 2, Column 6. Column titled "Stone Marker Put on Grave of Old Soldier." The Vidette-Messenger, Valparaiso, Porter County, Indiana; August 18, 1936; Volume 10, Section 4, Page 12. Column titled Two Vets of Revolution Buried in Porter County." The Vidette-Messenger, Valparaiso, Porter County, Indiana; October 25, 1941; Volume 15, Page 1, Column 1. Column titled "Plat Graves of War Vets Over County." The Vidette-Messenger, Valparaiso, Porter County, Indiana; November 20, 1957; Volume 31, Number 118, Page 1, Column 8 and Page 6, Columns 6-7. Column titled "County Held Battan In High Esteem," by The Stroller [William Ormand Wallace]. The Vidette-Messenger, Valparaiso, Porter County, Indiana; February 12, 1966; Volume 39, Number 187, Page 1, Columns 4-5. Column titled "Cemetery Vandalism." © 2018 Steven R. Shook. All Rights Reserved. Thank you, Steve! I have enjoyed reading your well-written, meticulously researched papers. very good research -- must have taken some time and travel.